This interview took place on: October 3, 2016. Click here for Paper Route's Artist Profile page. Jesus Freak Hideout (Nicole Marie Vacca): For many fans, myself included, Real Emotion was a long anticipated release. You announced back in the late summer of 2013 that you were heading into the recording studio for your third album. What were some of the roadblocks you had to overcome to create Real Emotion? Chad Howat: Ooh...how much time do you have? Chad: JT, do you want to take it? JT Daly: Yeah, well...the first thing was that we needed to kind of get adjusted back home. That's sort of our practice at least. Some people can just swing right back into getting back from tours and adjusted to life, but I think we sort of need a detox period and it just takes a bit to sort of figure out what do we have to say again, because that's really the only reason why you are in a band. Really, it's what do we have to say sonically, you know, what's it going to sound like, and also, what language, like, where are we now? And I think whenever that well sort of runs dry, we'll probably pull the plug and it just kinda takes you awhile to get back in that headspace. So we did something called "Band Camp" to kind of kickstart everything--just these exercises to remind us why we love writing and recording. That sort of led us to moving into this place called the North House, where we got away from everything and were able to really just sort of focus on the writing and recording out there, because your environment can really sort of speak into the creative process sometimes, and when nothing is around you, all you have to do is create. That kind of helped us focus a lot. It was right around this time that we lost our drummer [Gavin McDonald] and I think that was probably the biggest hold up, I'd say, because it was just Chad and I in the North House and the band has consistently been just Chad and I. The band started because Chad was making tracks and I started singing on them, so that has always been the common thread through everything, but there's a huge difference between three people and two people. Three people is band, two people is...a very awkward duet-- (*Chad and JT laugh*)--for the type of music that we're making. So, it really sort of put the pressure on. I think we really couldn't rely on the songs answering the question of whether or not we were gonna be a band, or what type of band we were going to be this time around, it really came down to us just as human beings and friends for over a decade deciding, "yeah, this is what we wanna do." And we took our time with that and it was right around then that Nick [Aranda], our guitar player, who had been touring with us for years, just kind of became a no brainer, like, "let's bring him in," and bringing him into the House because he has this overwhelming amount of positive energy, and see just what happens. We brought him in and it was just effortless. He fit perfectly, and I'd say from that point on, the writing and recording was pretty amazing. The only other hangup you have after that is, it just takes a while to release an album, like, the business side of things. I don't know if a lot of people know that. You know, you turn in an album, and a label sometimes six months just to press for something. So, it was a lot of hurry up and wait, but we made it, we're here, we're on the phone right now. Chad: Also, I just wanna add, we wrote, probably 150 snippets of ideas, or full blown songs. We just had a threshold of what's fitting all of us and making us feel something, and that we're not retreading anything. So in order to get to the quality we have to sometimes, at least so far, it's always been through a lot of quantity, a lot of really cool ideas that just may never get heard, because for whatever reason, it's just not easy to write songs. You know, good, "great" songs I think. We kind of hold ourselves to a high standard. So, it just took us awhile. [When] we have to get in a van and tour, we have to believe in every single note of every single song. JFH (Nicole): Yeah, you definitely want to be authentic. Now, when Gavin McDonald departed from the band, you wrote on Facebook that, "we no longer have the luxury of naivete, like we did when we made Absence, nor do we have the crippling pressures that accompanied The Peace of Wild Things. These things have been replaced with bravery and confidence." Did you kind of feel like you had nothing left to lose at this point, and you had a no-holds-barred approach to creating Real Emotion? JT: Uh, that's exactly how we felt. Chad: Yeah! I don't remember when we wrote that, but that was really well written! JT: Yeah, I think we felt free, maybe for the first time in a very, very, very long time, with this album. We felt free to do whatever we wanted, because we really just had nothing to lose on this one, and we sort of just made it for ourselves. That sounds, you know, sort of backwards sometimes, and it might sound a little selfish, but usually those are my favorite things that my favorite artists do, when they just kind of make it for them again. Because that's what I really connected to. You can't really pay attention to what the people around you are saying. We just found ourselves in a spot where it was just for us again. JFH (Nicole): You signed to Kemosabe/Sony back in 2015, what was that transition like going from independent to signed again? Chad: Well, our record was, for the most part, written, which is almost, I hear, the best case scenario, because you got to create a lot of things in a vacuum, without too many people voting on your songs, and giving input, because that really waters down that creative process, for us at least. So we had the luxury of having a lot of the cornerstones of the album kind of sketched out and fleshed out, so we knew that if a label wanted to sign us, they would want what we're doing, and like the songs that we're already making, which helps you kind of stick to your vision and not have to wonder "well, I wonder what this label would want from us." So we kind of had our vision for the record and the only thing we didn't have was an outlet, and they came along and were fans of the band, loved what we're doing, encouraged us to go further, even with our vision, to just do whatever we wanted. So it was a really great transition, pretty seamless. With a label comes resources, so then we could finish the album the way we wanted to finish it. JFH (Nicole): That's awesome, when they give you the freedom to kind of do what you want, and they support your vision. Chad: Yeah, we got really lucky, it's kind of rare a lot of times. I think we've been doing it for so long that we're pretty stubborn, and so anyone that would want to sign us, hopefully they knew what they were getting themselves into when they signed us. They gave us a lot of trust, which is pretty awesome because we have a lot of friends who are signed to labels and it turns out to be nightmare situations, but we kind of just call our own shots and they just were very supportive. JFH (Nicole): You stated in an interview recently that Real Emotion is about mental health and healing. Can you elaborate on that? JT: Yeah, um...man, I mean, I think it's just, being mostly pointed out that that took stepping back to sort of, you know, fully see that picture. I don't think we realized when we were making it that there was that many references, but, yeah, it's a tricky thing, it took stepping back to realize this album was largely about mental health, mostly in getting healthy, and what might seem artificial to one person is very real to someone else, and that's how we stumbled on that album title. It's a very real emotion. I think artists are especially guilty of using their complications sometimes as a crutch, and I can relate to that, but I don't know we necessarily believe so much in that perspective anymore. I think that maybe the healthier you get the more you're able to create and dig deeper and even go darker, because you can--you're able to ask a whole new set of questions that you were never able to ask before. And it was a process, I mean, we all went through some stuff, and me specifically, I got off some medication while we were making this album and then went back on medication while making this album. I was engaged at the time and it was a very real thing for me to see this woman that was signing up to be with me for the rest of my life see a completely different version of me. JFH (Nicole): What's the story behind the track "Untitled"? Chad: So, right before we moved into the North House, we had been stringing demos for a little bit, but we knew we needed to shake things up, which is why we decided to move out to that house in the hills of Tennessee. So I kind of had a last minute burst of inspiration, and I wrote a bunch of songs, and I finally felt like I was on a roll--I felt like I had writer's block for a long time. And that was one of them--all the music was for "Untitled," for the most part, I kind of had sketched out. The night after we set up everything, first day we moved our whole studio to the house, and I played JT two tracks, one was the track that became "Balconies," and the other was the track that became "Untitled." He asked me to send them both to him via email, so he could work on it on his computer. And then I think it was the next morning, he came up [from] the basement where his station was set up, and essentially had the whole song, all the lyrics and melodies just completely outlined. It was shockingly one of the easiest--I mean, those two songs especially are probably the two easiest songs we've ever written. Not that those aren't very good songs, but I think those are pretty strong songs. So yeah, that's how the music started, but JT, do you want to speak into the lyric at all? JT: Yeah...I was engaged and just finished a season of my life where I was devouring all of these books on human sexuality, and just the studies of fidelity and infidelity, and what it's like to choose one person, and how that sort of collides with religious perspective and the way that I was raised and just what my sort of moral compass sort of gravitates towards. This was, I think, the first song on the album that I tried to tackle some of that. Where it's pretty much a hymn, like I wanted to approach it the way that hymns are just repeated over and over again. I grew up in the church, we all in Paper Route grew up in the church, and you can't really ever undo that from your DNA. I think that we tried when we were younger because it's not "cool," you know, because people [could make us an] easy target, especially in the press. But now I just don't really care at all anymore about that, because it's just such a part of the way that I approach music. To think about when I was a kid, I was just always around people that were standing and singing together, unified. That's a really powerful thing that I can't really get out of my brain. That just seems natural to me--people come together, they sing in unison for something. And it's usually these very easy phrases and sometimes it repeats, and repeats, and repeats, and it builds, and it drops, and then it gets big at the end. This was our spin on that, just with universal lyrics about fighting for the one you've chosen. And it stuck. JFH (Nicole): Yeah. That segues nicely into my next question--you mentioned on your Facebook page that "Chariots" was written in response to a question. What question inspired you to write this song, and what is the answer? JT: That was the second song, I think actually the only other one on this album--we usually tend to tackle fidelity a lot in Paper Route songs, but that was the second song where it's just like, "Where's the blood?" is the question, like "Show me the proof. Show me why you're leaving." And if you're really going to leave me, I'll send my chariots to fight for you. And without you in this with me, then they'll fall, I'll lose that battle. JFH (Nicole): During the writing process for Real Emotion, you mentioned online that one song would fit well in a Cameron Crowe film. Did that song make the cut for the final album? Chad: It did, I think--I don't know who said that, but I believe it was in reference to the song "Balconies," because it had that driving anthem thing. I think that was the song that we were referencing, but I can't remember if that was for sure. We all like the old Cameron Crowe movies--he just made some really cool films in his heyday. He just had that overly romantic, idealized version, like that's [the] kind of life he dreams. I think "Balconies" just sounded like it would fit in the back of some classic scene that he hasn't written yet or something. We'll see--it remains to be seen if he's gonna use it or not, but Cameron--if you're reading this--it's all yours, buddy. JFH (Nicole): What drew you to the story of Dr. Zhivago, and how do the tracks "Lara" and "Zhivago" play into Real Emotion as a whole? JT: Dr. Zhivago, my mom always told me, was the first movie I ever saw, (Nicole: Aw...) because while she was pregnant, she would watch it multiple times and then when I was born, she would just have it on, and that kind of led to me as a kid, like when I was 5 or 6, I just loved the soundtrack, so it was just kind of on a lot. So I remember watching it some years later and just realizing how heavy and ridiculous of a story that was, like the most epically intense romance movie of all time--I mean, it's almost laughably dramatic--but it's just this gorgeous, very, very long film, and I don't remember how exactly I was talking to Chad about this, but it came up and I remember him telling me "Man, I wrote this song, (*Chad laughs*) and it has this awesome melody in it," and I just started singing "Zhivago." For the album we totally changed the words, but I remembered you talking about it and I did it. So, I heard it, and I think I changed two and a half words to that song or something. Something along those lines. I connected it more to the film, but pretty much that was it. The melody and lyric were done. The music, gosh--that took a very long time. Chad, you wanna speak into that at all? Chad: Well, yeah, just going off what you said, JT and I have been writing songs together for 15 years, so it gets harder and harder and harder to impress the other person and surprise them, and I knew it would be kind of like a sucker punch if I used something from his childhood, like I knew he would not be able to resist it, so it worked. *laughs* So that's why, you know, I was choosing between "Zhivago" and "Chicago," and I didn't know which one I wanted to do, and I thought, well, I think JT would go for "Zhivago" if I throw it in there. Anyways, yeah, the music, I don't know why I think the original demo sounded like a really bad Foo Fighters song, or something. (JT: Or like Weezer.) Yeah, or like Weezer or something, and I thought, I don't know how this will work. I kind of decided to approach it with a Graham Coxon kind of guitar line, and that was one of the first things Nick and I worked on at the North House when he became an official band member, was coming up with that guitar theme. All the chords and the melodies stayed the same but we didn't have like a good musical bit for it. The drum beat was the hardest thing in the world to figure out. I remember we spent days trying to come up with the drum beat and we realized the stupidest, dumbest beat was what the song needed. So JT drummed up that song, and we were done. JFH (Nicole): You released the very catchy single "Laugh About It" this past February. Can you tell us about the concept behind the music video? JT: It's very rare that we just release something to someone, [thinking] "Man, you do whatever you want, we trust you so much." And Israel Anthem wears that crown because he just came in with so many incredible ideas, so many amazing references, kind of shooting from the hip the same way Chad did on "Zhivago," where Israel just fired off everything that blew our minds when we were kids and immediately hooked us, and we're like, "Oh, yes, we're so in." Just [like] with those 90's music videos where they're very dark, but there's a wink the whole time, and it matched the song perfectly because that song almost didn't make the album just because it's "you sing along to it until your nose bleeds." It's a very hooky song to a fault, and the only reason why it did make the album is because of the lyrics, where the lyrics fit bullseye with the album, and we loved the sort of juxtapositions between the two where you have a really catchy song, and a really heavy, almost dark lyric, and we felt like the music video matched it. [We] just sort of came in and told [Israel] we'll do anything you want. So he had us playing all these different characters. I remember in one scene he was telling me "be like a creepy Baptist pastor in this one," and I'm like, "Alright, cool!" "And in this one you're like Charles Manson," and I was like, "Okay, let's go for it!" And I just kind of had to play all these different people and I think in the end he probably knows exactly what it's about, and I think he's the only guy that will ever know, and I'm fine with that. JFH (Nicole): So in some ways it's open to interpretation? JT: Exactly. You can tell me what it's about, actually. JFH (Nicole): *Laughs* I know some people online--because there were people who saw you filming, they posted online that they thought it was a Slenderman video. JT: Yeah, we actually loved that. Chad: Yeah, I wish it would've stuck. JFH (Nicole): What is your favorite song from Real Emotion, for both of you? Chad: I think the title track is kind of one of our collective favorites. Obviously we felt like it was the best album title for what this represented, but that song just felt so collaborative, and almost like we just caught a fish, like it wasn't like somebody brought that song in and we kind of fleshed it out. We're all just in the studio working on stuff, trying to line all these ideas for something special and once we kind of found this theme, it just kind of all started to come together, and I think we all just got really excited at the same time. Also, I think it's such a vulnerable song, lyrically. I think it's brave musically, it was a lot of things we did, and at the same time on a very basic level it's also a very simple song in a lot of ways, too, so it's kind of playing a lot of different roles. So I kind of like that song--we all felt like it was kind of the centerpiece for the record. Right now, today, that's my favorite song, but I don't know about JT and Nick. JT: Yeah, I'm the same, for everything Chad said. I'm just such a sucker for mid-tempo songs that don't feel slow, that's everything I love about music--a song that you can walk to. Like, I love the slow-motion walk videos, you know, all those 90's videos like "Yellow" [by] Coldplay, "Bittersweet Symphony," like all those sort of music videos where the guy's walking, you know, and it feels so sick. That is my jam. JFH (Nicole): Yeah, we gotta bring back the 90's videos. Chad: We did it with "Laugh About It." JFH (Nicole): There's a very diverse soundscape on Real Emotion, and at various points you include a harp, a harmonica, a violin--did these instruments come to your mind when you were writing the songs, or did you decide to add them later during production? Chad: There's not really a difference for us, a lot of the time. Sometimes the sound and the production inspires the song. So, a lot of times the instruments and the way a track will make us feel will cause us to make different melodic and lyrical decisions, too. So, it's always different. We don't really separate our process out, I mean, like we're still creating tracks in the van driving to masterings, for a couple interludes, like that "Blue Collar Daydream" was done after mixing was technically finished while we were mastering. So, we don't really separate like that so I don't even know--I think the harmonica was probably an afterthought we wanted, like in "Vanisher," because it was an old thing that we used to do, but the track just seemed to make us feel--I don't know, I always felt like it was the right move right there. But I don't know...I think we just kind of chase inspiration, and then we'll see the next day if we like it or see if it's gotta get deleted. JFH (Nicole): Yeah. I think it sounds gorgeous on the track. JFH (Nicole): Each of your albums, I've noticed, features a different primary color--red for Absence, yellow for The Peace of Wild Things, and blue for Real Emotion. Several songs on Real Emotion mention the color blue as well--was this on purpose? JT: Yes and no. The lyrics were totally by accident. I had turned in a whole bunch of songs where I'd used the color blue in them, and Chad had turned in some, you know, it was in his "Zhivago" lyric, and it just kind of became an effortless theme, to the point where we almost had to leave some out, or it was happening too much. JT: Yeah, Chad was the blue police. Chad: Somebody had to do it, I guess. JT: No, I appreciate it, man. We arrested a few lines and took 'em out. The primary color scheme was very much planned. JT: Yeah, visual art is a big deal to our band. I came from that world and did it for awhile. So I incorporated it into our music, it was a huge thing, and we also tend to write a lot of times with visual art in mind or--like Chad was mentioning, the Cameron Crowe stuff--we usually write a lot with films going on silent, or shows, we did that a lot. For every album, in fact, I can remember what we were watching, which is kind of creepy. Not creepy--it just made me kind of sad for nostalgia reasons. JT: Yes! Yes. Bizaare. Life moves. JFH (Nicole): Would you guys ever consider scoring a film? JT: Yeah, that's an absolute dream. Chad: We're all obsessed with soundtracks and we have a very cinematic approach to not only our music but our visuals and our live show. We definitely approach music and a lot of life in this kind of cinematic place. Part of me thinks that it would be a natural progression for us, honestly, to score a film or an HBO series. Probably, I was gonna say, some awesome video game that JT and I have never heard of. JT: Yeah, it'd be like "War Crunchers!" Chad: War Crunchers sold 15 million copies last year! JT: Yeah, I don't even know what you're talking about. JFH (Nicole): Going back to the album art, I watched the behind-the-scenes video where you and Micah Bell decorated that room with the different posters and all the other visual elements representing the songs on the album. Are there any easter eggs in the album art? JT: There definitely are. I mean, I can't give away every secret. I will say there are some things where you had to be there to see. Like, in the dresser in the back left-hand corner on the album cover, in the dresser drawer, there's a whole bunch of Aaron Rodgers posters because we are all very, very large Aaron Rodgers fans. There's some things like that. A lot of the pills spell different words, and you sort of had to be there to witness that. I'm trying to think of something you would see on the cover that you could actually figure out. Let me think--Chad can you think of anything? JT: Well, there's a very interesting one that I don't think you can fully see, but there's a record player, and on top of the record player it says "I am David Dark's target market." David Dark is an author who I was having lunch with one day, and he's the person that I was talking to about the sort of sans medication, back on medication, he's the one I was telling, "I just don't know how to describe it, it's embarrassing, but it's a very real thing, it's a real emotion," and he was like, "That's an album title" and he got out his pencil and wrote it down on the newspaper that he had and handed it to me, and it just said "Real Emotion." We didn't really full-on name the album that day, but it was always an album title contender, because it's that moment. So, obviously the album title stuck, and there's a David Dark nod in the art show. JFH (Nicole): Nice. And I notice the table on the left side, I think the pills spell "Laugh About It," right? JT: They do. That's the most obvious thing. JFH (Nicole): I made out that one. Chad: Did you find Waldo in there? JFH (Nicole): I did not. Is Waldo in there? Chad: Waldo is hidden. Look really hard. Chad: It's white and blue stripes, though. JFH (Nicole): Ok, I'll be on the lookout. What do you want listeners to take away from Real Emotion? Chad: We're basically like architects of a park or something. So we created this park, there's a playground, there's benches, there's a lake, there's a path around it, there's gardens, and our job now is done. So, you could have little kids going on the slides, you could have a couple falling in love or proposing, you could have a 75-year-old man scattering his wife's ashes in the lake. It's for the people. It's for everyone. We've done our job, and now people can get out of it what they're supposed to get out of it. But I don't think we'd ever be like "We need to get this out of that." I guess the collective hope is that people get something out of it. What they get out of it is more important than getting something out of it. JT: Yeah, that's very true. JFH (Nicole): Beautifully put. You wrote on the Paper Route blog back in 2014 that there were a lot of songs written for the third album and that you were excited to release the B-sides. Is there any chance we might hear some B-sides in the near future? Chad: I was just thinking about that, actually, last night. I would say--near future, I would safely say no, because we're way too excited to perform these new A-sides live and to give them our full attention and do them justice, kind of launch them off into the world, but we definitely have a lot of things we just didn't get around to finishing because of time constraints or it just didn't make sense for this record stylistically or lyrically. I know we do want to be more active in the coming years. We don't want to wait this long again to release new material, so I could see us doing something soon, but we want to really put all our focus on Real Emotion. There's definitely a ton of ideas that we've got that might see the light of day at some point. JT? JT: No, I think that's safe to say, I think that's great. We definitely have no intention of keeping those songs to ourselves, I will say that. It's just never really been the right time. We've made so many label shifts and kind of just been through a lot, honestly, as a band, and we survived all of that so we're very thankful, but we just haven't really had the opportunity to release B-sides. That's usually something a band does when things are going really, really awesome, and we've always been kind of struggling just to stay out of the deep end, you know, and to keep on getting back to where we can survive. But I will say, to add to that, this is by far the best it's ever been for us, so that's why I'm pretty sure the B-side days are right around the corner for us. 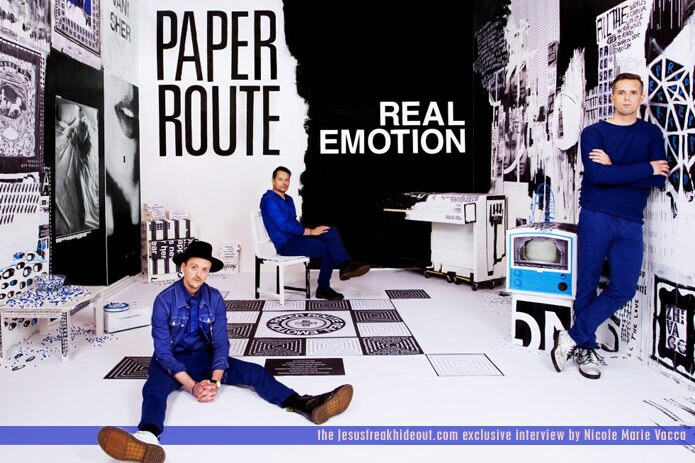 Paper Route's latest album, Real Emotion is available now!